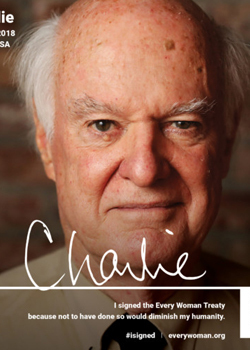 Dr. Charlie Clements is a human rights activist and public health physician. As president of Physicians for Human Rights, he attended both the treaty signing in Ottawa and the Nobel Peace Prize ceremonies a week later in Oslo for the International Campaign to Ban Landmines. He has served as executive director of the Carr Center for Human Rights Policy at Harvard Kennedy School, where he was an adjunct lecturer in public policy, and a faculty member of the Harvard Humanitarian Initiative. Early in his career, Charlie worked as a physician in rural villages during the civil war in El Salvador, an experience recounted in Witness to War (Bantam 1985). He is cofounder of the Salvadoran Medical Relief Fund and Pax Americas, a political action committee. In 1992, he was a special guest at the signing of the peace accords that ended the Salvadoran Civil War. He is currently Professor and Clinical Coordinator of the Joint Physician Assistant and Public Health Program at Touro University California.